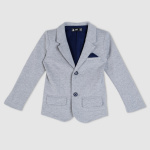 Make ordinary formal occasions stylish with this long sleeves blazer. The notch collar and button closure looks smart and elegant. Pockets are added for enhanced use and versatility.